When a senior loved one faces progressive memory impairment, it’s important to treat him or her with empathy and respect. Seniors with memory impairment run through a range of emotions and dismissing their feelings as insignificant often makes the situation worse. Here are a few tips for communicating with a senior loved one who has memory loss, brought to you by the memory care experts at Home Care Assistance in Harrisburg. If your elderly family member is wondering where a loved one is or says they’re waiting for someone who has passed, indulge in the memory and go along. Therapeutic lying could prevent a meltdown, as correcting him or her might upset them and they will inevitably forget again. If your loved one becomes agitated, it often stems from fear or changes in his or her environment. Don’t say things such as “This will pass,” or “Get a hold of yourself.” Instead, try to redirect the focus on something positive. For instance, offer some tea or suggest a walk. You can also simply ask your loved one how you can help him or her feel better. Seniors with memory loss might say things based on delusions, hurtful things, or actual lies. Don’t take anything your loved one says personally. Your loved one’s memory impairment is not a normal sign of aging, it is a progressive disease and should be treated as such. If caring for them becomes overwhelming, professional Harrisburg dementia care can help. With memory impairment, your loved one may repeatedly ask for the same details. Be patient. Don’t say, “You’ve asked me that already.” If your loved one is asking again, it’s because he or she does not remember. Getting frustrated, impatient, or reminding them of their memory loss could lead to depression and affect your loved one’s self-worth. 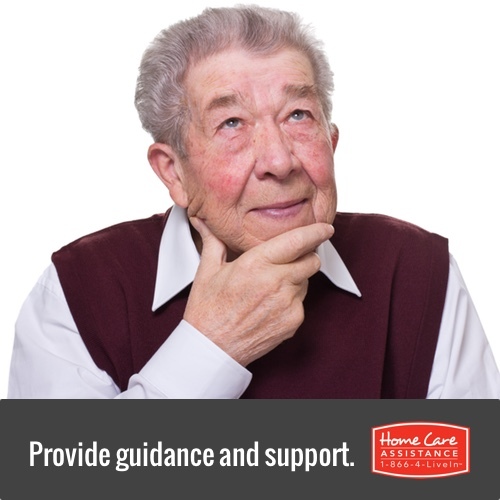 If your senior loved one has recently been diagnosed with dementia, Harrisburg Home Care Assistance can help. We are the leading experts in Harrisburg live-in care, and one of our experienced dementia or Alzheimer’s caregivers can provide the loved one with the around-the-clock care your loved one needs. To learn more about our services, call our office at (717) 540-4663 and speak with a knowledgeable and friendly Care Manager.